Luxury living interior design can be achieved on a budget… and not a big one. As a seasoned interior decorator, I’m going to share 25 of my top ideas for creating your own slice of heaven at home. If you’re on this website you’re probably as obsessed with architecture and interior design as I am. Excellent! Isn’t it a wonderful hobby or career? Or both? Whilst there are LOADS of expert tips, many of which appear on the pages of this blog, these are some of my favorite go-to solutions. Of course, I strive to be an interior decorator for my clients not to simply foist my tastes. So these luxury living interior design ideas can be personalized and tailored for your unique home. Of course, I strive to be an interior decorator for my clients not to simply foist my tastes. So these luxury living interior design ideas can be personalized and tailored for your unique home. Take the ideas and make them your own. Ready? Let’s go. 1.Luxury interiors are always elegantly tidy. Create calm by decluttering and letting a space ‘breathe’. Clear up kitchen benchtops, allow spaces in shelving and displays. Allow the eyes to have somewhere to ‘rest’. 2.When creating displays on flat surfaces – a vignette – keep collections to uneven numbers. Group in sets of 3, 5, or 7. This is visually more pleasing to the eye. Vary the height of objects to create interest by using flowers, lamps, and books to elevate smaller items. 3.When choosing soft furnishings, look for the best textiles you can afford in textured finishes. Velvet cushions or heavy knit throws immediately add comfort, warmth, and va va voom. 4.In a simple glass vase, use foliage instead of flowers to create a very Vogue display for tables and dressers. Go for a BIG display or bunch 3 vases together. 5.Small spaces, such a toilet, powder room, or small study look dramatic in dark colours. Moody ink blues and other dark jewel colours can look FABULOUS. One of my favourite ideas is to choose an expensive wallpaper for a small space. It won’t cost much to create a very high-end result. 6.Look at eBay and Gumtree with a designer’s eye. You’ll find luxury looking pieces that may only need new paint or upholstery to look amazing. 7.Up-date wall art to match the seasons. There is no reason why you have to have the same art all year ’round. 8.Give your living room an immediate overhaul by replacing one major piece of furniture. This could be a sofa, chair, rug, or dresser so make it a piece that draws the eye and gives a unique appearance to the room. 9.To give the illusion of higher ceilings, use vertical patterns on the walls. A striped wallpaper is perfect for this purpose. 10.Balance heights in a room to stop the space being ‘bottom heavy’. With furniture on the floor, create height by using a floor lamp or large plant next to a sofa, a pendant light over a table, or an artwork above a console table. 11.For a quick and inexpensive fix, change out door handles. Choose luxe finishes such as polished metal, glass, or even leather straps (perfect for the kitchen) to update tired decor easily. Polished and glass finishes give a luxury look on a budget. Paint the doors in a semi-gloss finish if desired. 12.Wallpaper or paint the back of shelving. Position books or larger items towards the bottom to ‘anchor’ the look and decorate shelves with object d’art. Leave spaces to allow the shelving to ‘breathe’. 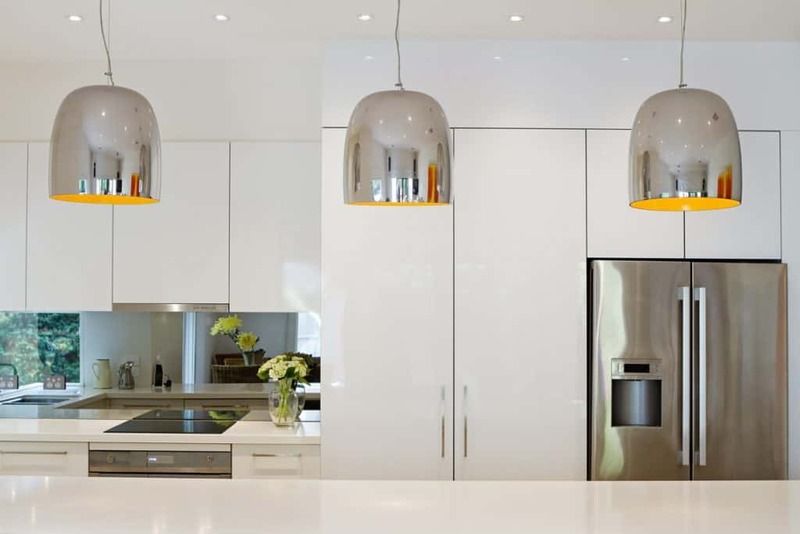 13.Hang pendant lights so there is 70cm to 80cm between the table top and the bottom of the light. 14.Think wisely about lighting. Create a plan for side, table, and floor lamps. Position them so they cast a flattering light. 15.For a calming neutral palette, start with a neutral base – cream, beige, pale blue, light gray, baby pink, soft green – and then layer with different textures in the same tonal colours. 16.Ensure rugs are the right size for the space. If they are too small or too big the result won’t be luxe. Ensure the back legs of chairs don’t ‘fall off’ and that rugs don’t swamp a room. 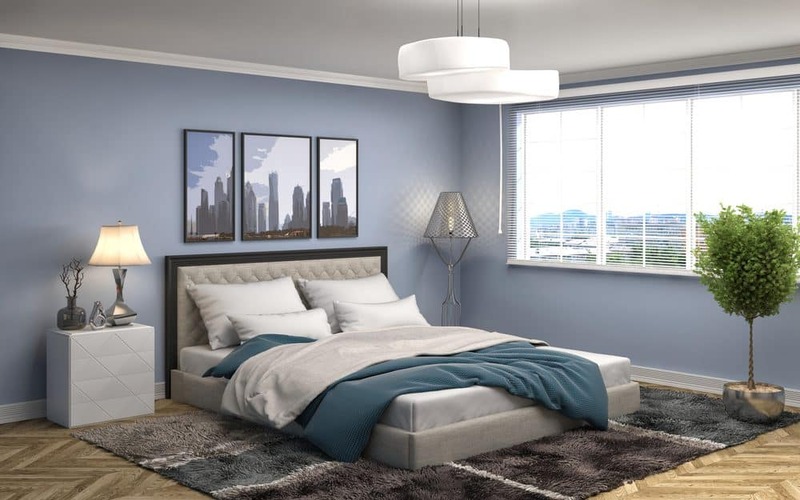 17.Create a calming effect in the bedroom with white, pale blue, or light gray bedlinen. 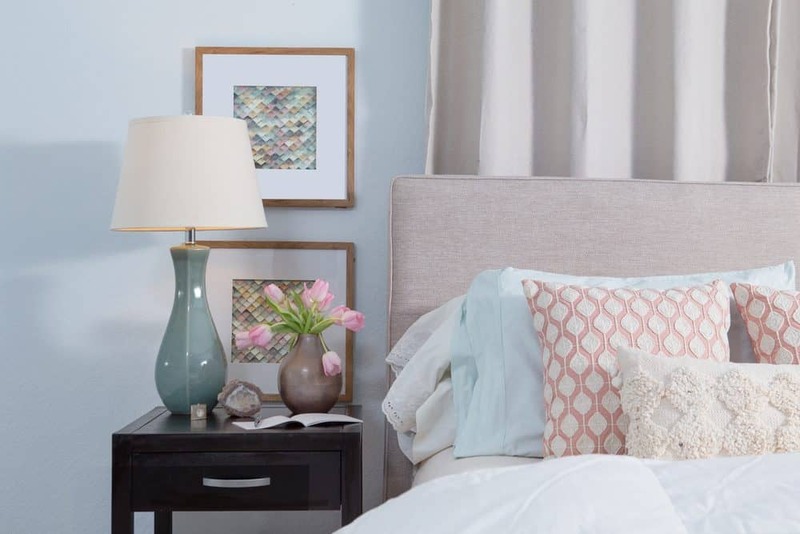 These tones add cost-effective luxury but amp it up with some bedside flowers. Make sure they are NOT heavily scented. Buds in white, cream and pale pink in a gold vase is a luxury look. 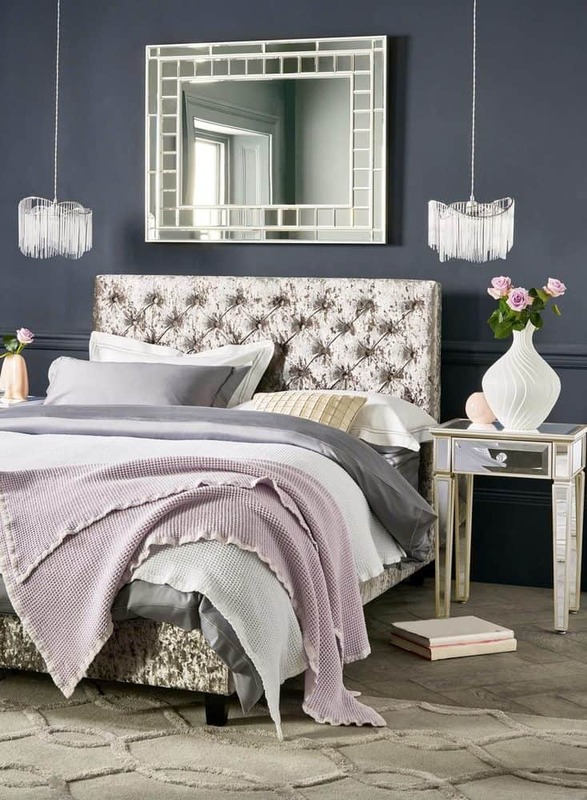 18.Add a luxury feel to your bed not with masses of cushions but with a beautiful faux fur or velvet throw. 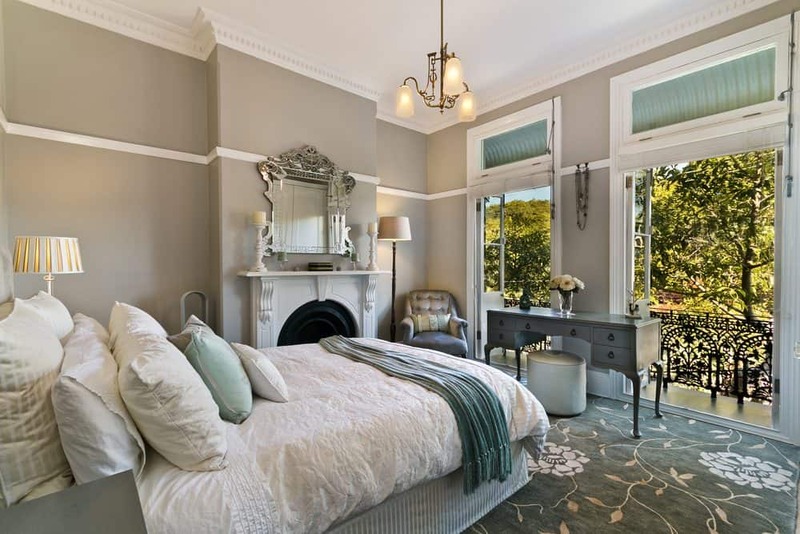 19.Instead of bedside lamps or hanging pendants, why not have floor lamps? These will create interest and give your bedroom a luxe feel simply because they are a different choice. 20.Hang curtain rails close to the ceiling (regardless of window size) and allow billowing fabric to cascade down to the floor. 21.Keep luxe order on your dresser by arranging items on a gorgeous tray. A mirrored bottom tray looks glamorous especially when you place your perfume bottles and scented candles on it. Keep candles away from perfume bottles, though, you don’t want perfume to be near heat. 22.Bathrooms are now more like Day Spas so add that luxury feel by using tactile materials to evoke the senses. If you can afford it, use handmade tiles, marble, granite, and luxe polished or matte metals. On a budget, choose quality textiles for luxury touches, replica fixtures, and add scented candles and flowers. Orchids or a fern are great choices for a luxe look. 23.If you can’t afford genuine marble there are excellent marble-look tiles for a fraction of the price. Try Beaumont Tiles for a selection as used in Australia on ‘The Block’. 24.Bathrooms aren’t all about the tiles. 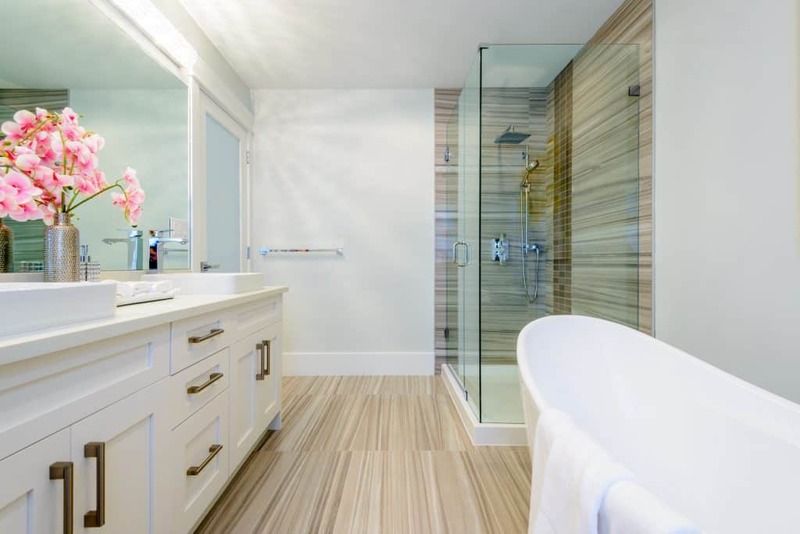 There are now excellent wood flooring and paneling options that are engineered specifically for the bathroom. So they are moisture-proof and hard working in wet and steamy spaces. Try your local Bunnings store or Google search ‘bathroom wood panels waterproof’. 25.When designing a laundry, always give consideration to bench space for folding & sorting and hanging space for airing. Rails and s-hooks are a must. Even consider a retractable line for hanging & airing. Header image courtesy of Andrew Loader Design. For everything you need for a beautiful home, why not check out the high-quality retailers where you’ll find sales and special deals every day. New retailers are added each week. 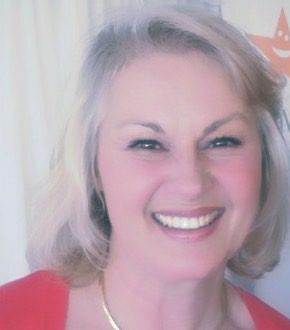 CLICK HERE: Retailers include Bed Bath ‘n Table, Brosa Furniture, Canningvale, Cookware Brands, Glasshouse Fragrances, Go Lights, Hunting for George, Kitchen Warehouse, Pottery Barn, Sleeping Duck, Temple & Webster, Zanui, and MANY MORE.